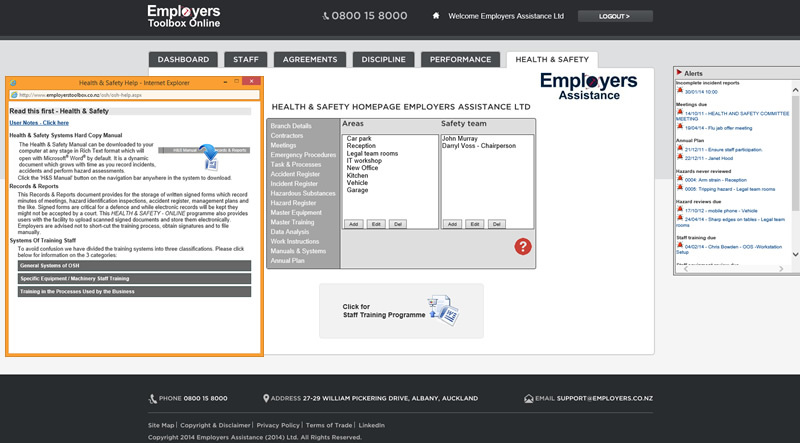 Manage your workplace Health & Safety online. 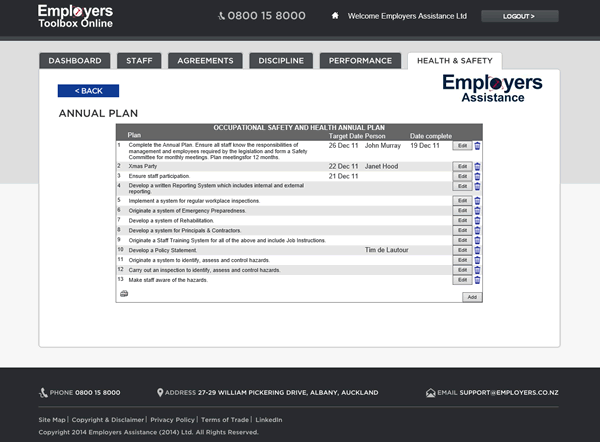 Our new Health & Safety framework provides a compliant and up-to-date system for the new Health & Safety at Work Act 2015. 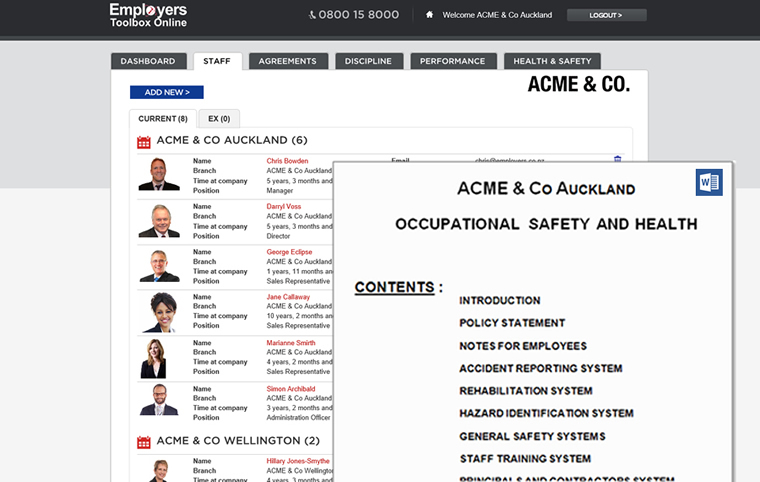 It enables businesses to manage and monitor their workplace health and safety obligations through a web browser. 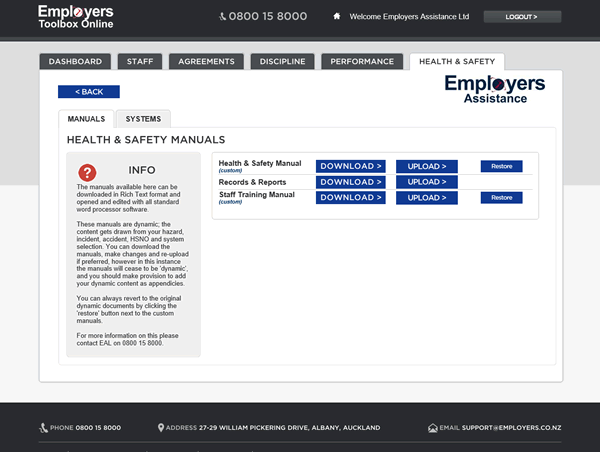 Fully integrated with the Employers Toolbox, the Health & Safety systems link to your staff files to provide a comprehensive profile of your employee's interaction in their workplace environment. Dynamic registers for workplace incidents, accidents, hazardous substances and hazards with scheduled email alerts ensures you don't forget important events or overlook due tasks. Upload documents and photos to provide media rich reports. PDF and word documents provide on-demand reporting across the system. Behaviour based work instructions provide a framework for users to generate comprehensive training and monitoring systems for hazardous tasks. This is a subscription based product, and prices start from $35 + GST per month for Employer Support Package members and from $50 + GST per month for non members. The, minimum term is 12 months. Work towards WSMP compliance for your business while creating a safer work environment for your staff and minimising the exposure your company has in the event of accidents.